Computer gaming desks come in a variety of designs, and they can be made of many different materials, including stainless steel and PVC plastic. Both materials are ideal for gaming desks, because they are tough and durable, and can hold the weight of your monitors, processors, and more. Now, you may think that metal or PVC furniture is going to look ugly. Actually, it is quite the contrary. You may be surprised when you start shopping around to see just how attractive furniture made from these materials can be. In fact, you may even buy more than just computer gaming desks made from these materials. Cleaning – Other desks, such as those made of glass, are going to be dirty all the time, and not overly easy to clean. This is not the case with steel or PVC. Both materials are easy to clean. All that is required is a quick wipe with a damp cloth for PVC and a stainless steel cleaner for the steel computer desks. While steel does pick up fingerprints, they are easy to remove with a quick spray and wipe. There is also a great advantage to having steel instead of a wood computer gaming desk. This is the fact that germs can’t live on the steel, so it is considered to be basically hypo-allergenic. Steel actually has anti-bacterial properties, so you don’t have to worry about any germs lingering and making you or anyone else in your home sick. Price – Wood furniture is quite expensive, and it can be the same with glass computer desks. When you choose steel or PVC, you are going to get a great looking desk that is price much lower than desks made of glass or wood. If you are buying a computer gaming desk for a college student and you don’t want to spend a fortune, PVC and steel are likely going to be your best options. Both materials are sturdy and durable, so they are going to last for many years just as a wood computer desk would. You can even get steel and PVC painted to look like wood, so you have the appearance of a wood computer gaming desk without the high price. A Statement Piece – One of the greatest things about a steel computer desk is that it is going to look amazing. In fact, this could likely be the statement piece in the room. If you get one that has a color, it can even go along with your decorating scheme. You can easily get steel furniture to match other colors in your home because it is much easier to paint than wood. It is often the same with a computer gaming desk made of PVC plastic. This material can be molded into any shape, and you can get some pretty unique pieces of furniture that will really stand out and get noticed. It also makes a statement by being environmentally friendly. The materials are often recycled, and they are always recyclable, and this is going to make your computer desk even more of a statement piece. Stability – With a desk that is put together in components, such as a steel computer desk, it is likely going to be taken apart and put together many times (if you are moving to a new location, changing the room your system is in, etc.). After a while, it is going to get more and more difficult to put the piece together so it is stable. Screw holes will end up stripped, and things are going to start to wobble after a while. You will have to be very careful when it comes to assembling, disassembling, and reassembling your desk. It is a good idea to find one place for it, and leave it there for as long as you possibly can. This is not as big of a problem with PVC furniture, because it is often molded and in one complete piece, and if there are components they often simply snap together. Longevity – While steel furniture is usually built to stand the test of time, it is not always the same of desks made of PVC plastic. Over time, the plastic is likely to break down, and then the desk is going to eventually fall apart. If you do choose a PVC computer gaming desk, don’t be surprised if you end up needing to get a new desk in a year or two. Also, because it breaks down easily, it is not exactly environmentally friendly. Not only will the parts end up in a landfill, which is the only way that it is going to be long-lasting because the materials will take many years to completely break down. Just making the plastic for a desk can be damaging to the environment because of the processes used. PVC also isn’t nearly as good looking as furniture made of steel or other materials. When you get down to the real nitty-gritty, you will likely find that a steel or a PVC computer gaming desk will be a much better investment than one made from wood or glass. Unlike glass, neither of these materials is going to break or scratch. While you may get the odd scratch on stainless steel, it can easily cleaned up with a bit of steel wool. There really is no way to get rid of scratches on glass, and you need to resurface wood. Steel and PVC computer desks are less expensive than wood or glass, and they come in a variety of shapes, sizes, and styles, so you can find one to fit in with any type of décor. When it comes to buying furniture for your home, you likely want things to match, so there is an even flow. If you tend to prefer classic furnishings, the last thing you want for your computer desk is something that is made from glass or metal. You want something that is made from beautiful wood. There are actually several advantages to buying wood computer desks, but there are also a few disadvantages. Here we will be discussing both. Appearance – You won’t find a more attractive desk than one that is made of wood. There are so many intricate patterns and lines in wood, and this is something that metal and glass just can’t compete with. You have the option to have a natural stain to bring out these patterns, or to have the desk painted in a color that will match the rest of the furniture in the room. A wood desk will look terrific in just about any room in your home, and it will add a touch of elegance wherever it is. You can also get wood computer desks in a variety of styles, including traditional desks, hutches, and secretaries, so you are never limited. No matter what you need for your gaming set-up, you can be sure that it is going to be as attractive as it is functional. Easy Maintenance – Glass and metal desks can be difficult to keep clean because they pick up every little fingerprint. Many people say that they spend more time cleaning their desks than they do actually using them. This is not a problem when you have a wood computer desk. All you need to do is give the desk a wipe every day or two in order to get rid of the dust, and if you want, you can use a bit of wood polish to really bring out that beautiful wood grain. If you do spill something on the desk, cleanup is easy. All you need to do is spray a gentle cleaner on the surface, and wipe away the stain. Unless you have chosen a black desk with a shiny surface, you won’t see fingerprints on wood, and even if you happen to miss a couple of days of wiping the desk down, it isn’t going to look dirty. Make an Investment – If you purchase a quality piece of wood furniture, such as a computer gaming desk, you are actually making an investment. Obviously, a cheap desk isn’t going to last long, and it will likely fall apart. One that is made from quality wood is going to last for many years, even decades. These desks are so sturdy that they will be handed down from generation to generation, and the appearance will never go out of style. These desks are durable, and even if you move frequently they are going to be able to stand up to a lot of moving around. Also, because wood is strong, you won’t have to worry about the desktop bowing under the weight of your monitors and other computer gaming gear. This is not something that can be said of desks that are made of laminate or press board. Weight – One of the biggest disadvantages to having a wood computer desk is that it is going to be heavy. Once you have it in place, you likely won’t want to be moving it around any time soon. Unless you are able to disassemble it, you may also find that it is difficult to move from home to home. This may not be the best choice of a desk for a college dorm room because students aren’t going to be there long, and then they will have to find a way to get the desk out of their room and into their next place of residence. Even if you just want to move it to a new spot in a room, it is going to be difficult unless you have one or two people to help. Price – Another disadvantage to buying wood computer desks is the fact that they can be extremely pricey. While there are some computer gaming desks that are made from press board or wood laminate that are cheaper, they are not always as cheap as they seem. The “cheaper” desks are more likely to fall apart within a year or two, so you will have to spend more money to buy a new one. But, the next step up may just not be within your budget. You can expect to pay at least $200 to $300 on a solid wood desk, and the prices just continue to rise from there. If you are going to invest this kind of money in a desk, it is important that you shop around and do your homework to make sure that you are getting the best desk at the best price. If you are looking for a computer gaming desk that is going to be attractive, durable, and easy to keep clean, wood is going to be your absolute best option. Sauder is a great company to start your wood desk search. We’ve created a comprehensive buyer’s guide here. Glass desks tend to get dirty quickly, and you will see every fingerprint, water drop, etc. It is the same with metal desks. Also, unlike glass and steel computer desks, you don’t have to worry about a wood desk breaking or falling apart. You may have to spend more money to get a wood desk, but you will be much happier with your purchase in the long run. If you are looking for a new computer gaming desk, you have many things to consider, including the materials that the desk is made of. You basically have three options: wood, metal, and glass. If you are looking for something that is attractive and sleek-looking, glass is likely going to be the best option for you. A glass computer desk is going to be stylish, and it is going to look great in any room in your home. A glass desk looks especially great in a home with modern furnishings, and it will really add to the feel of the room. Quality of Materials – The glass used in glass furniture, such as computer gaming desks, is not like the glass you would find in a typical window. It is much sturdier because it is actually tempered glass and has a steel frame. With regular glass, you wouldn’t want to set anything overly heavy on it, because it is likely to break. This is not the case when furniture is made of tempered glass, such as most glass computer gaming desks. The frames are generally made of coated or stainless steel, so they are not going to break or bend under the weight of your PC, monitor, etc. You have the option to choose glass that is clear, and there are also computer glasses made of smoked or colored glass to really up the ante with the appearance. Functionality – One thing that is extremely important to gamers is that their desks be as functional as they are attractive and durable. Most class computer gaming desks are made in a variety of styles and are designed to hold all of your gaming gear. Look for a glass desk that has a sliding tray for your keyboard. Many glass desks also allow you to be able to mount your processor to the underside of the desktop, or on the side. This is going to help keep it out of the way, and make cable management a lot easier. You can also get desks that have separate or removable shelves, so you can customize your desk for your specific computer gaming needs. Easy to Move – While glass is heavy, most glass computer gaming desks can easily be taken apart so you can move them around piece by piece. This is not something that can be said of a wood computer desk because these are usually solid and extremely heavy to move around. If you are moving, or simply want to move your gaming desk to another room, you will find it a lot easier to move a glass computer gaming desk than a wood desk, because you won’t have as much weight to worry about. Simply disassemble the desk, move each piece individually, and then re-assemble it. Make sure that when you disassemble that you keep the hardware in a plastic bag or a bowl so you don’t lose anything. It is also a good idea to mark each piece so you know where they go, and take a photo. Breakage – It is true that it takes a lot of pressure before the tempered glass used in glass furniture, including computer desks, will break. But, there is one thing that you do need to be aware of. Tempered glass isn’t just going to crack and break off into large pieces. It is likely to shatter, and there will be tiny shards of glass all over the place. You do need to be careful with tempered glass furniture for this reason. It is a good idea to get into the habit of not pressing against the edges or corners of the glass. This can cause the glass to weaken considerably, and then it is going to be easier for it to end up breaking. Appearance – If you decorate your home in a traditional style, such as country furnishings or antiques, a glass computer gaming desk may not be the best option for you. It is really going to stick out like a sore thumb because it will be a stark contrast to the rest of the furnishings. Also, you are going to have to clean it frequently. Glass and metal easily pick up fingerprints, and unlike wood desks which can hide marks, every mark is going to really stand out on glass furniture. It is a good idea to keep a bottle of glass cleaner and a roll of paper towels nearby when you are using a glass computer desk. You may even want to set up one of the shelves to be specifically for cleaning supplies, so you don’t have to search for them every time you need to clean the desk. All in all, if you are looking for a computer gaming desk that is functional, sturdy, and attractive, you can’t go wrong with glass. It is less cold in appearance than one that is made completely of metal, and it is going to be more modern looking than a traditional wood desk. As long as you take care of it properly, it should last for many years, and you will have a gaming desk that you can easily modify when you want to add new gear to your gaming system. Why should you get Dual Monitors for your Gaming Set-Up? Anyone who is a serious gamer knows that in order to have the best gaming experience, you need to have multiple monitors. Now, you don’t have to go crazy and get a lot of monitors. For one thing, that is just going to be expensive. For another, you may not even have space for all of this gear. Ideally, if you have never used multiple monitors before, you should start out using two monitors. Using dual monitors for your gaming set-up is going to take your gaming experience to the next level. Also, you can enjoy using dual monitors for other applications, including photo editing, streaming television shows and movies, and more. If you are really serious about your gaming, having dual monitors for your gaming set-up is a great investment. What is a Dual Monitor Set-Up? Basically, a dual monitor set-up is just as it sounds: two monitors. Many people prefer to use dual monitors because they will be able to increase their gaming productivity. There are a number of games that will support the use of two or more monitors, and once you start gaming like this, you will find it incredibly difficult to go back to a single monitor. With this type of set-up, there are, as with any gaming set-up, advantages and disadvantages. Luckily, the advantages far outweigh the disadvantages. There are so many advantages to using dual monitors for your gaming set-up that it is actually difficult to figure out where to start. Screen Space – One of the biggest advantages is the fact that you get to have much more screen space. This is going to greatly enhance your gaming experience. If you are playing games where the landscape is more horizontal or vertical, having dual monitors will allow you to see everything that is going on around you in the game. This can be extremely advantageous because you will stand a better chance of surviving. If someone sneaks up on you, it is more likely that you are going to see this in time and take steps to keep from being attacked. In many cases, the panoramic view is going to be much more important than the vertical views, and you are going to be more successful in your gaming with dual monitors. Better Views – You also get a view of the game that is more realistic, because you can see more of the landscape. Today’s video games are more realistic than ever, and the more screen space you have, the more you are going to be able to see this. When you have one small screen, you are not really going to get the full effect of the game. Multiple screens will give you the gaming experience that you have been looking for. Become the Character – Another advantage of using dual monitors for your gaming set-up is when you are playing first-person shooting games. For instance, if you are playing COD, you want to be able to see everything that your character would be seeing. Dual monitors is the best way to achieve this. You will be able to really get into the game, and you will become the character you are playing. Many Games Support Multiple Monitors – There are loads of games that are made for multiple monitors, and more are being created all the time. The very first Internet game to support the use of multiple monitors was “Clear the Swarm”. Once that hit the market, gamers were eager to have more games that they could play with dual monitors. Other games that allow this technology include: Microsoft Flight Simulator 2000; World in Conflict; Burnout Paradise; Supreme Commander; DOOM; Dirt 2; and Team Fortress 2. One of the most popular games that you can use two monitors for is World of Warcraft (WoW). WoW allows you to become the character, and when you are using dual monitors, the experience is that much better. One of the best advantages when playing World of Warcraft is that you get to see the game in a number of views without actually missing out on anything because you are so busy looking around at everything. Hardware – Most newer computers will support the use of multiple monitors. If you have an older system, you may need to upgrade. But, if you have a new computer system, you won’t have to worry about spending a lot of money on another monitor and then not being able to use it. In order to be sure that your system will support dual monitors for your gaming set-up, simply look at the back of the PC. The information you need will be right there. If there are already more than one video card installed, you are all set. If we are going to discuss the advantages of using dual monitors, it is also important to discuss the disadvantages. Luckily, even though there are disadvantages to using multiple monitors, they are very minor. The biggest problem is the vertical size. Yes, you are going to get a great horizontal or panoramic view, but the vertical view is not going to be as good. This is because it is also increased, and it can actually be hard to use, as well as hard on your eyes. Another disadvantage is that using dual monitors can affect how you share your resources. When you are using two or more monitors, the video card has to work for all of them. You may not have the best quality like you would have with a single monitor. You could end up with less video memory, and lower processor performance. All in all, serious gamers need serious gaming gear, and that includes at least two monitors. As long as you have space, you can easily set up a second monitor, and have that ultimate gaming system you have been waiting for. One final word of advice is to try and get monitors that are the same size, or close to the same size, and the same type for the best gaming experience. When it comes to setting up your computer gaming system, you are going to have a lot of cables to deal with. Now, some people just let the cables hang willy-nilly. But, this is not the ideal situation. Not only does it look terrible to have cables hanging all over the place, it can also be dangerous. It only takes one errant cable to cause someone to trip and fall. Many people have actually fallen while getting out of their gaming chairs because the cables were around their feet. All you have to do is apply cable management for your gaming desk, and it is pretty easy to do. Before you start, take a look at your computer gaming desk. The amount and size of the cable holes will help to determine how you are going to deal with cable management for your gaming desk. One of the first things you should do even before you start trying to organize your cables is label them. Once you have things set up, there may be times when you need to rearrange things. When you are trying to get in behind your computer desk, it can be a tight fit, and having the plugs labeled will make it easier to know what to unplug and what to leave plugged in. 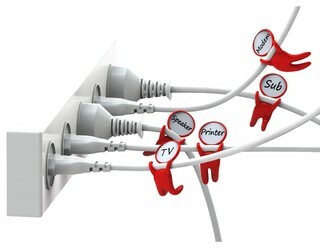 You can buy cable identification labels, or make your own with masking tape and a Sharpie pen. It is also important to keep your cables short. In most cases, your gaming desk is going to be close to the outlet or power bar, so you don’t need to have long cables that can get tangled up. This is especially important if your desk doesn’t have a lot of cable holes. Find something to wrap each cable around to shorten them, and make sure that they are secured with tape or ties. This is going to keep everything in one place, and ensure that there are no stray cables that can be tripped over. Depending on the type of computer gaming desk you are using, there may be holes where the cables can come out the back, but there may not be enough, or they may not be large enough. This means that you will have trouble organizing and hiding the cables, and your gaming area will look messy. The first thing to do is to tie up the cables. You can go out and buy special cable ties, or you can just use string or anything else, even plastic zip ties. Before you tie up the cables, it is a good idea to label them as you did with the plugs, and then to find ways to hide the cables. Foam pipe insulation is a good idea, and it is inexpensive. Cut the insulation to the right size, slice it open lengthwise, and slip the cables inside, or use a PVC pipe. Just remember, it won’t be flexible, and it may not be the most convenient method of cable management. Another option that is even less expensive is to do the same thing with a paper towel tube. No matter what type of computer gaming desk you have, there are likely going to be times when you do have at least one or two under-desk cables that you want to hide. One way to do this is to use a wire basket, and it won’t cost you a lot of money, as you can get many different types of wire baskets at your nearest dollar store. It is important that you use the labels and cable ties first, and then slide them into the basket. You may even want to place the basket right in a corner, so you can attach the cables to the desk and let the longer parts hang into the basket. You will also likely want to manage your laptop and cell phone power cables. One of the easiest, and least expensive ways to do this is to use binder clips to attach them to the side of your computer gaming desk (the desk needs to have a bit of a lip for you to do this). 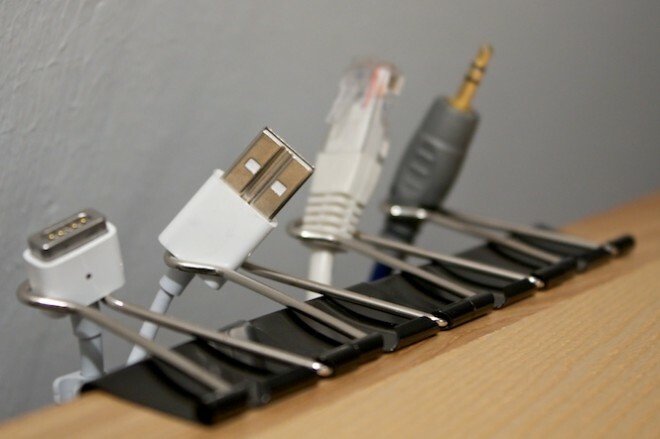 All you need to do is run the wire through the binder clip, and then clamp it to the desk. These are just a few of the things you can do to keep all of your computer gaming cables neat and free of tangles. When you are just letting them hang, not only do you risk tripping over them, but you also risk breaking the fine wires inside the cables. It is never a good idea to bend cables, and this can easily happen if they are hanging down and you are stepping on them. Be sure to also have a good computer gaming desk. That way, you will have all of the cable holes you need to have an ideal cable management system.